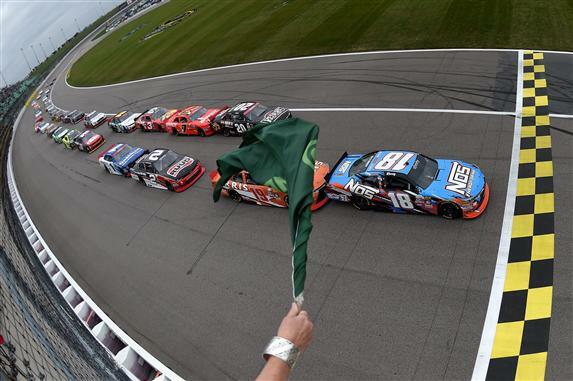 What to Watch For: The NASCAR Sprint Cup Series heads to Kansas Speedway for its second race of the Chase for the NASCAR Sprint Cup Round of 12. Jimmie Johnson leads the Chase Grid due to his win at Charlotte. He is followed by Matt Kenseth (31 points above Austin Dillon on the cutoff line), Kyle Busch (+27), Brad Keselowski (+25), Kurt Busch (+24), Carl Edwards (+20), Martin Truex Jr. (+19), Denny Hamlin (+3), Austin Dillon (three points behind Denny Hamlin on the cutoff line), Chase Elliott (-3), Joey Logano (-6) and Kevin Harvick (-8). … Jimmie Johnson attempts to take sole possession of the Kansas Speedway wins lead. Johnson and Jeff Gordon both have three victories at the 1.5-mile track. Four drivers each have two wins at 1.5-mile tracks this season – Brad Keselowski (Kentucky and Las Vegas), Jimmie Johnson (Atlanta and Charlotte), Kyle Busch (Kansas and Texas) and Martin Truex Jr. (Charlotte and Chicagoland). … Non-Chasers Greg Biffle (twice), Tony Stewart (twice) and Ryan Newman have all won at Kansas and will try to spoil an automatic bid to the next round. What to Watch For: The NASCAR XFINITY Series kicks off the Round of 8 of its inaugural Chase. The eight drivers remaining are Daniel Suarez, Elliott Sadler, Justin Allgaier, Erik Jones, Brendan Gaughan, Ryan Reed, Darrell Wallace Jr. and Blake Koch. … NASCAR Sprint Cup Series drivers competing in the Saturday’s NASCAR XFINITY Series race include: Austin Dillon, Joey Logano, Kyle Busch, Kyle Larson, Regan Smith, Josh Wise and Matt DiBenedetto. … Kyle Busch is the defending race winner.